Tressa Middleton attracted huge press coverage aged 12 when she became Britain’s youngest mum - but the real story behind the headlines was far more complicated and heartbreaking. 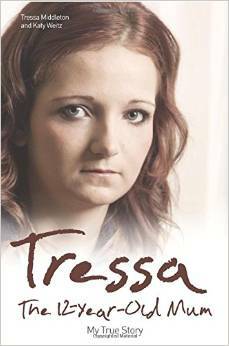 Tressa was the third child of four born to an absent father and an alcoholic mother who were regularly taken into care. Tressa was more like a mum to her youngest sister and later to her mother’s two young sons by other men. The abuse by her older brother began when she was seven but he used the family’s instability against her. He said that if she ever told, all the children would be taken permanently into care and they would never see their mother again. To protect them all she kept his dark secret. By now her mother Tracey was a heroin addict and unreachable to Tressa. Almost inevitably, she followed her mother down the road of addiction. However, by 2011 she was determined to turn her life around and now aged 20, she hasbeen clean for three years. Tressa: The Twelve Year Old Mum has moved into the Amazon Top 10 bestsellers. There’s been lots of coverage for Tressa: The 12-Year-Old-Mum, including this appearance on ITV This Morning.